As the sun set on the World Cup, Rio's iconic statue gave the world an unforgettable image. Shortly after half time during the World Cup Final, the TV coverage showed the sun setting behind Rio's Christ The Redeemer statue. Twitter went crazy for the image. #ChristTheRedeemer became a worldwide trending topic. ESPN's version has been retweeted over 20,000 times. It's all over Instagram too. The iconic image was shown on the scoreboard inside the Estadio do Maracana. And later, as the sun disappeared below the horizon, the moon made for an equally striking scene. Lit with the colours of the Brazilian flag. And after Germany's victory, the statue was lit up in their national colours. Naturally the sunset image has become a meme already. There's even an 8-bit version. 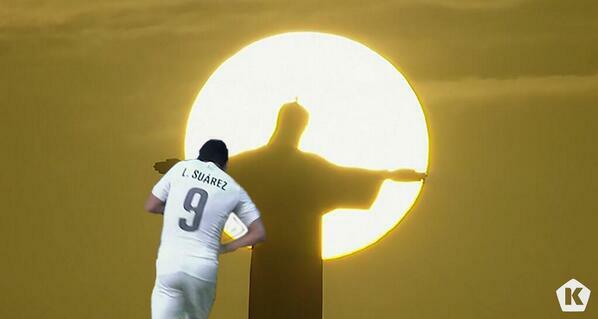 And here come the Suarez gags.